It’s technically fall right now, but given the heatwave we are in, it still feels like the dog days of summer. 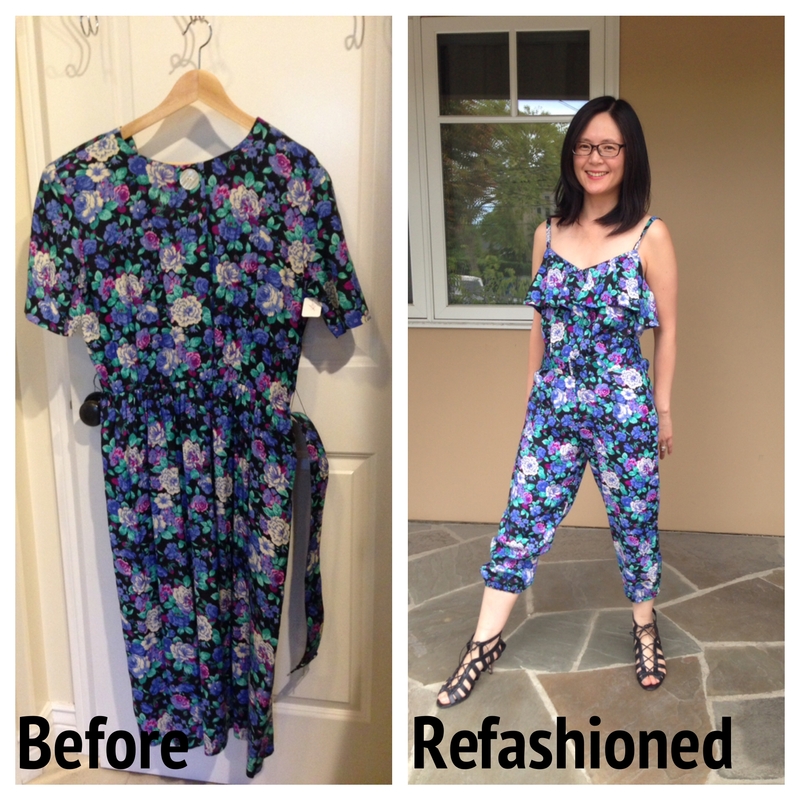 I had a hankering to make a summer jumpsuit, and when I saw this floral dress at the thrift store, I knew I could upcycle and refashion it into the perfect jumpsuit. 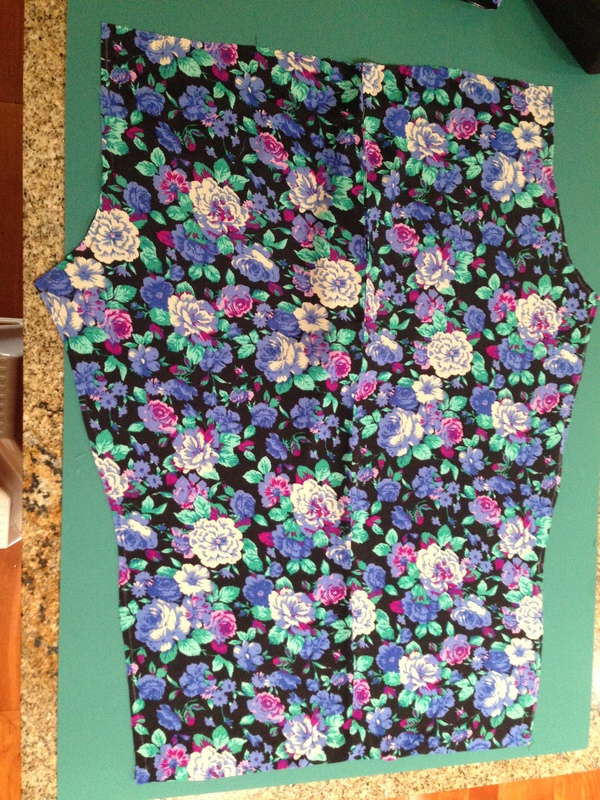 What drew me to the dress was the floral pattern and how it popped against the black background. I also liked how fluidly the fabric draped. Check out the $5 price tag. I picked up this pattern at the fabric store. I knew right away the dress wasn’t long enough and I would have to make this into capris, but that didn’t bother me as the shorter length would provide even more relief from the heat. I chopped off the sleeves, buttons, belt loops, shoulder pads and zipper. Then I cut the top from the bottom at the waist seam. 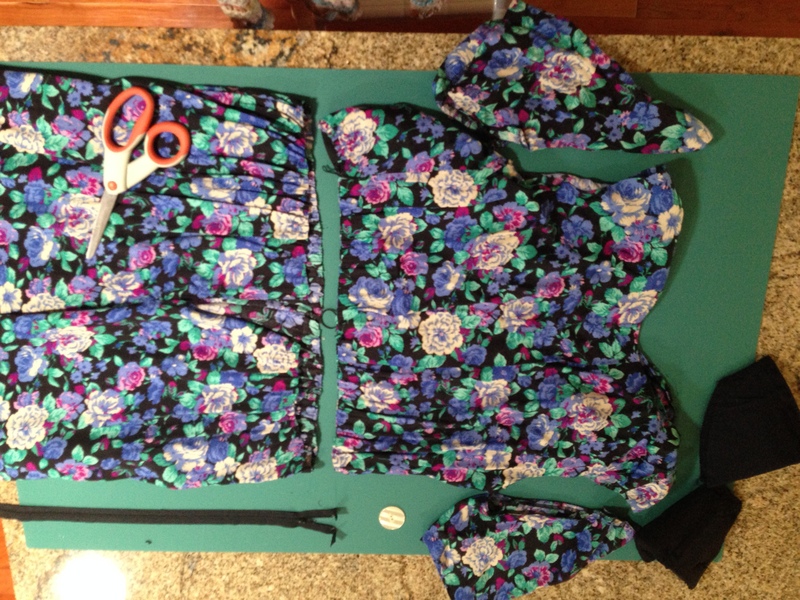 Once I cut out all the pattern pieces, I saw I wouldn’t have enough fabric for the bottom. For some odd reason, the pattern pieces for the pants were unusually wide. I knew right away I would have to improvise the bottom and use the pattern pieces for the top. I’m short and petite and knew the skirt as is would be enough fabric, so I used an old pair of pajama bottoms as my pattern. This is the first time I copied a ready to wear garment, but I’ve read many tutorials and was familiar with the process. The pajama bottoms were constructed with 4 pieces. I isolated one piece by folding the garment behind each seam and then laid it against the fabric. Then I traced a seam allowance around the piece (I eye balled a 5/8″ seam allowance). 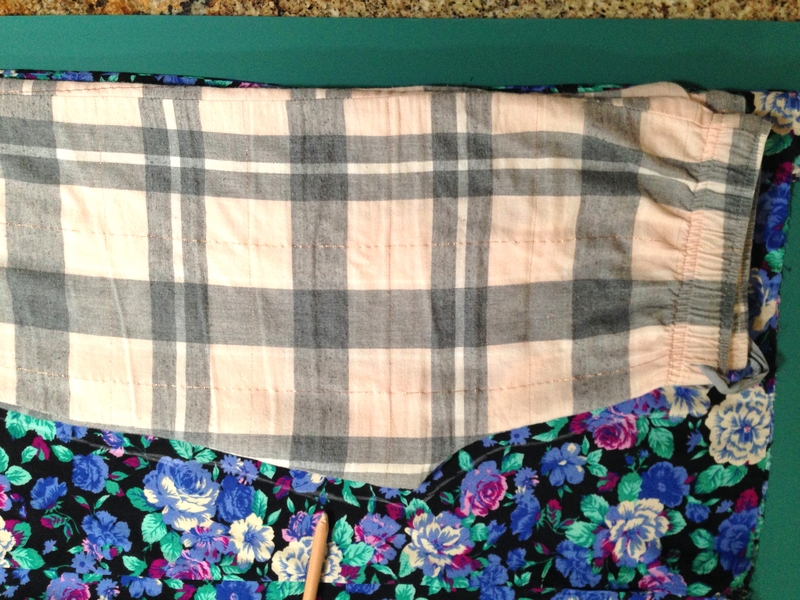 I’m a really lazy sewer and wanted to use the existing side seam of the skirt with built in pockets as the side seam of the pants, so I laid the side of the pajama bottom right up to the skirt seam and did not include a seam allowance. I traced a front pattern on one side of the seam and a back pattern on the other side. Once I cut it out, it looked like this. 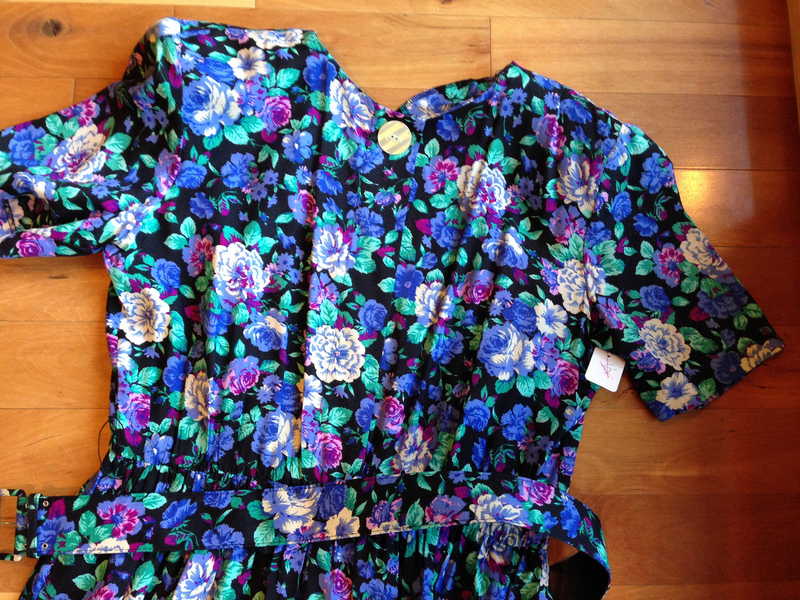 I pieced the bottom and followed the pattern for the rest of the jumpsuit. I love the final result. My only complaint is that the shoulder straps are very wide and feel like they are about to slip off my shoulders. 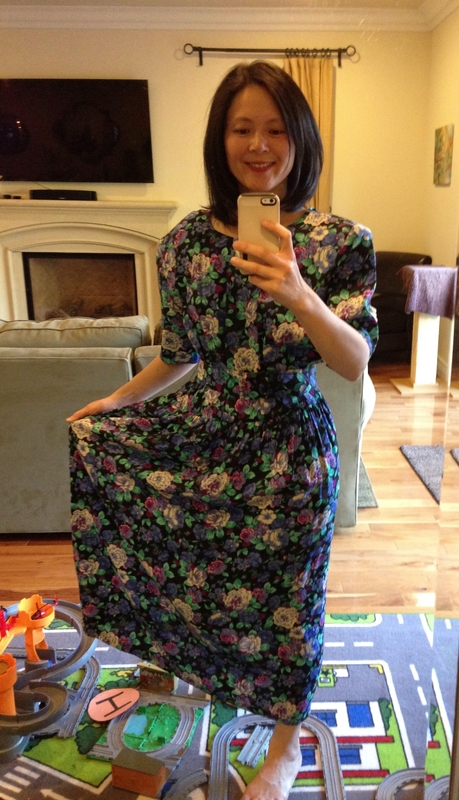 Ok, on to the next refashion! So cute, love the print. Crisis cross the straps at the back to solve the falling off the shoulder problem. Wow Love the result!! Want to try something similar. I’m wondering…When tracing the leg from your pajama bottoms, can you use that same isolated shape for both front and back leg pieces ? Or do you have to reverse the fold on your bottoms to properly trace the backside of your leg pattern? Sorry for the lengthy question. Great work!! Great question. You cannot use the same isolated shape for both the front and back leg piece. If you take a look at the back pieces, you’ll notice that the back crotch is much deeper than the front. You need the depth to accommodate your derriere.